Gorgeous pillow and the cover washes well. Crafted from 100-percent cotton, this modern pillow is sure to be the mood enhancing accent you've been looking for. With its fun colorings and stripe pattern, this pillow is sure to bring the earthy feel to any setting. This pillow has hidden zipper and knife edge. I LOVE this pillow! It is pretty big and true to its color in the picture. I decided to get the down filling and it is totally worth it, the pillow is heavy and is great quality. Great value and style. So glad I purchased. Has that Joanna Gaines/Fixer Upper vibe. Natural fibers (cotton) with texture. Not super soft but not scratchy. What you would expect from a pillow of this style and material. I upgraded to down fill. I like this option. Pillows will condense after use but easily fluff up again. 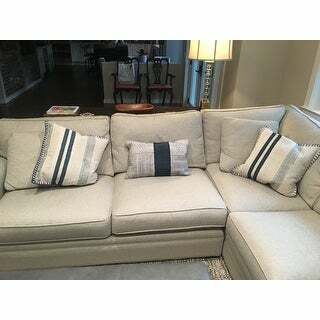 They look really distinctive on my new Arhaus couch with the natural linen like performance fabric. Perfect accent! Good quality pillow. Burlap like material. Not so soft, but attractive and different. I am extremely satisfied with this purchase. Good quality for the price. Overstock is awesome. I’ve been shopping with them forever. My very first purchase was a Sunbrella Patio Umbrella. I paid 3/4 less than retail. The quality, price and the fast delivery got me hooked. The 20 inch Horace pillows are more beautiful than shown on the site. I ordered four. 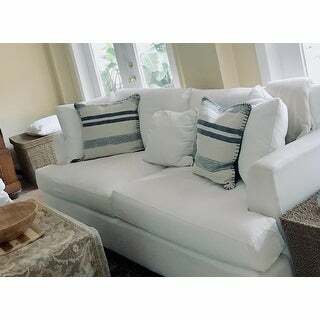 The large size sit well and look terrific on my twin (2 identical Sofas) Grand Size white slipcovered Sofas. Beware if your sofa is 70-86 inches. One pillow may block your seat. Also the color is a bit earthier than shown. Hemp. The blue is true to the color seen on the page. Worth ever penny. Thank you big O. Having purchased dozens and dozens of pillows over the years, I have to say that this is the best one I have ever bought. I love, love, love it! The material is top end, the design is perfect and the border stitching is just fabulous. This is a perfect fit for placing among other pillows on my daybed. I would absolutely recommend this pillow. After opening the box and seeing this beautiful throw pillow, I couldn't be happier with my decision in purchasing this item, I'm thrilled to own this pillow. Well made, nice pillow. Nice size. Good, true navy and cream colors. Natural cotton look. 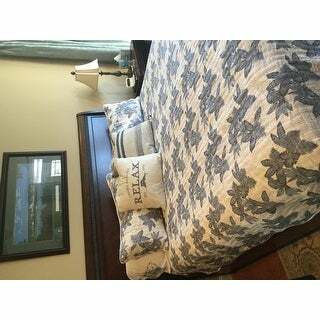 We picked this for its matching colors but contrasting navy and cream pattern and it looks great. This is a nicely made, heavy pillow. It's not over-filled, so you can give the top edge of it the perfect "dent". The pattern and color on it is soft but striking. Good buy! I purchased this pillow for a home staging project and am pleased with the looks of it. The quality is good and the down filling is nice to be able to "shape" the pillow. Color is accurately described. It is so pretty and very well made! A little pricy, but definitely worth it!! Just like the photo, but even nicer for real. It goes very well with the colors in my living room! Love the rough weave. I got the goose down very soft. The blues are denim like really like it. 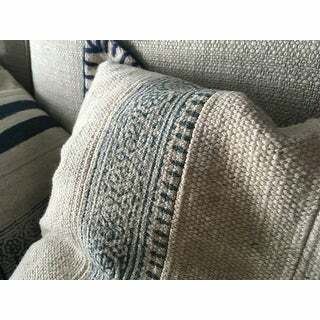 The yarn edge is an added extra element. Not boring. The design has a built in filthy look. The pillow feels rough and is uncomfortable. I am stunned since the reviews indicated that it was a great product. It's very rustic and looks and feels creepy. This pillow is spectacular and is q great focal point on my couch. I was looking for something that added dimension and just enough color that complemented my decor. PERFECT ! I bought 2 of these pillows to accent my couch and they are perfect! I highly suggest if you wish to add a little color and flare to your solid colored couch! Love the quality. So expensive looking and well made with details that aren’t visible in the photo online. Overall, high quality pillows for the price. They are hefty, and the material seems strong enough to stand a lot of wear and tear. However, they do seem to show dirt easily because of the light color and coarseness of the fabric. Dirt seems to get stuck to it easily. colors are exactly like the pictures. 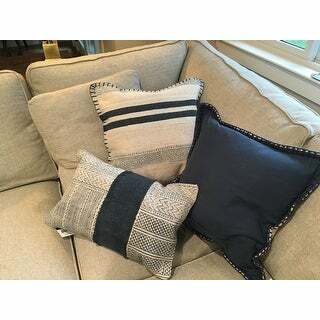 nice and sturdy throw pillows. Love the colors and quality! Very happy with it. Comfortable and beautiful. I would not recommend. I ordered 2. The blue bands were crooked on one. I sent that one back. The replacement arrived and the color is different from the original pillows. The new one has dark blue strips, almost navy, but the original one were a medium blue. Overall, I think the quality of these pillows is more on the order of *** each. Not a good value for the money. I bought two of these pillows for my daughter to go with her new blue couch. They are beautiful and made well. I would highly recommend. 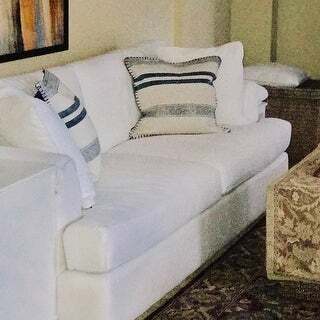 "The picture shows an off white pillow with navy stripes , however, there is an option drop down box that states the color as navy, am I going to receive the off white pillow with navy stripes pictured or a different solid navy version?" 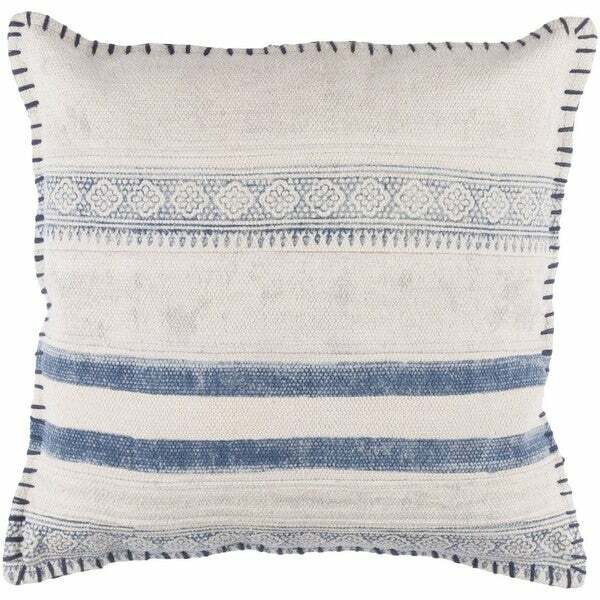 These pillows are beautiful the colors are off white & the blue is a denim blue, I absolutely adore these pillows! Goes perfectly with my decor. Exactly what I was looking for... and this was the best price I could find anywhere!